A 72-year-old man was evaluated by Ophthalmologist A on several occasions. The patient had cataracts, with best corrected visual acuity of 20/25 in the right eye and 20/40 in the left eye. Ophthalmologist A recommended surgery to remove the cataract from the left eye. 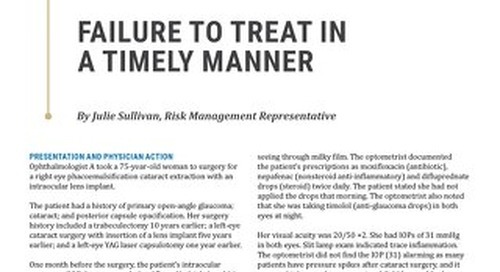 After discussing the risk and benefits of surgery, Ophthalmologist A performed an uncomplicated cataract surgery with intraocular lens implant on the patient’s left eye. The patient was prescribed both pre- and post-operative antibiotic and steroidal eye drops. Ophthalmologist A saw the patient the next day for a post-operative examination. The patient reported a slight headache and that his vision was still “a little cloudy.” Visual acuity was documented as 20/60 in the left eye. Ophthalmologist A noted 2+ inflammation in the left eye, but he did not find this to be concerning. The patient was told that it would take time for his vision to improve. Saturday morning — two days after the surgery — the patient called and spoke with Ophthalmologist B, who was taking calls for Ophthalmologist A. The patient claimed that he reported floaters, decreased vision, and the sensation of looking through a lace overlay in the left eye. 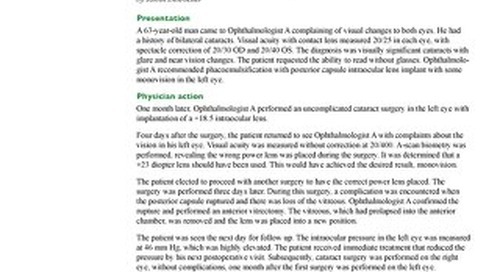 Ophthalmologist B recalled that the patient did not complain of any pain, which would be expected if there were an infection. Ophthalmologist B claimed that he offered to see the patient in the office that day and told him to call back if his condition changed. Ophthalmologist B did not document this conversation in the patient’s medical record. The patient recalled the conversation differently. He claimed that Ophthalmologist B simply instructed him to continue with his medications, but did not offer an appointment that day. The patient called again on Sunday morning, complaining that his vision in the left eye had worsened. The patient claimed that he was again instructed by Ophthalmologist B to continue with the medications and see Ophthalmologist A on Monday. Ophthalmologist B reported that when the answering service notified him of the call, the service indicated that the patient complained of pain. However, when actually speaking to the patient, Ophthalmologist B reported the patient denied pain and did not report worsening vision. The patient was most concerned about running out of ketorolac trometamol eye drops. Ophthalmologist B said that he explained to the patient that if he was not experiencing any pain there was no need to prescribe any more drops. He advised the patient to discuss this with Ophthalmologist A on Monday. 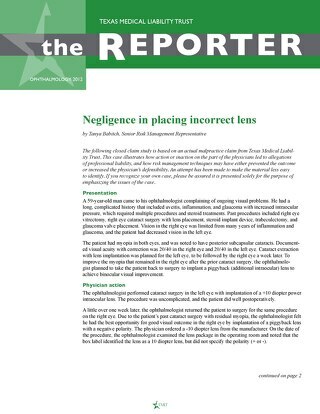 Ophthalmologist B recalled offering the patient the option to be seen that day, and he denied that the patient told him that his vision had deteriorated substantially. This second conversation with the patient was not documented. The patient returned to Ophthalmologist A on Monday, reporting to the nurse that he had received “no help” from Ophthalmologist B over the weekend. Of note, Ophthalmologist A’s documentation of this visit included that the patient denied pain over the weekend and discussed running out of eye drops. Ophthalmologist A diagnosed the patient with endophthalmitis and referred him to a retinal specialist for a same-day appointment. The retinal specialist saw the patient that day and confirmed the diagnosis of endophthalmitis. The retinal specialist took the patient to surgery that evening and performed a vitrectomy with injection of intraocular antibiotics. The retinal specialist confirmed that there was a hypopyon involving the anterior segment of the eye, which is an indication of an acute bacterial infection. Cultures of the ocular fluids obtained during surgery were initially negative. However, final cultures grew Staphylococcus coagulase-negative, but the lab noted “from broth only” and “possible skin flora contaminant.” After the vitrectomy, the patient’s vision could be refracted to 20/60, but he had ongoing difficulty with recurrent inflammation and retinal detachments. He required three additional surgeries. 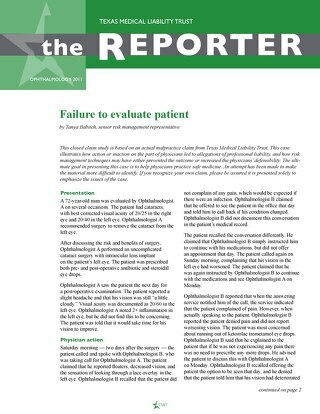 The patient ultimately lost the use of his left eye and has only light perception vision. 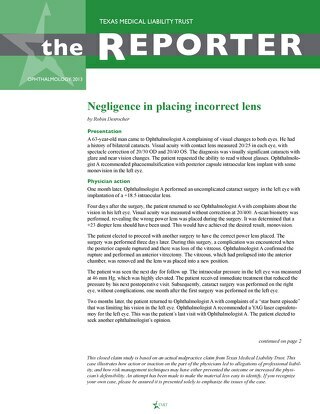 A lawsuit was filed against Ophthalmologist B, alleging failure to evaluate the patient in person when his symptoms required it. The patient alleged that he reported symptoms to Ophthalmologist B that justified immediate evaluation and treatment. Had he been evaluated in person, the eye infection would have been treated sooner, preventing his loss of vision. Ophthalmologist A was not sued. 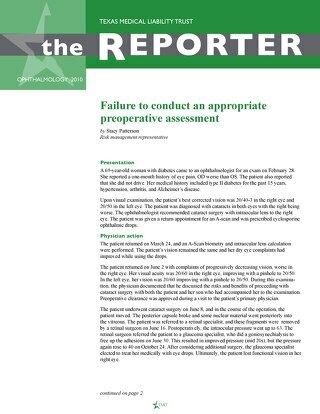 Consultants who reviewed this case felt that the delay in evaluation and treatment of the patient over the weekend negatively affected the patient’s outcome. Had the vitrectomy with the injection of intraocular antibiotics been performed sooner, the patient may have had an improved result. 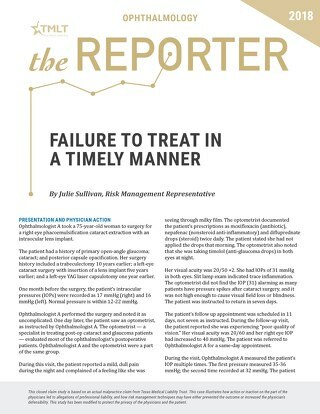 However, the consultants also stated that if the actual complaints reported to the on-call ophthalmologist did not indicate any signs of infection (pain, worsened vision) it would offer some defense to the physician. Unfortunately, these phone calls were not documented, and there was no way to determine what had been said. The cause of the patient’s endophthalmitis was unknown. The ocular fluid culture obtained during the vitrectomy was initially negative. However, the final result was not entirely conclusive, and there were questions about possible contamination. Consultants stated that negative cultures did not rule out an infection, particularly since the patient had already been given antibiotics. Though the retinal specialist documented clear signs of bacterial infection, one consultant argued that the negative cultures could have indicated an inflammatory process as opposed to an infective process. However, the retinal specialist stated that there was an infection present. 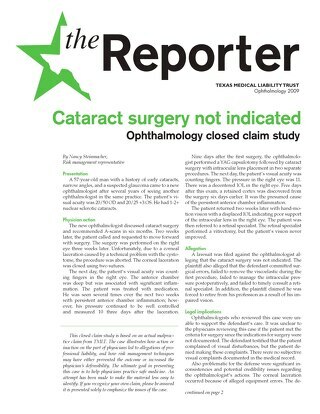 Consultants believed it was likely that the patient’s infection occurred at the time of surgery; therefore, it existed before the patient’s involvement with Ophthalmologist B. However, it was the consensus among the consultants that had the patient been evaluated by Ophthalmologist B over the weekend, the infection would have been identified and treated more promptly. This case was taken to trial. 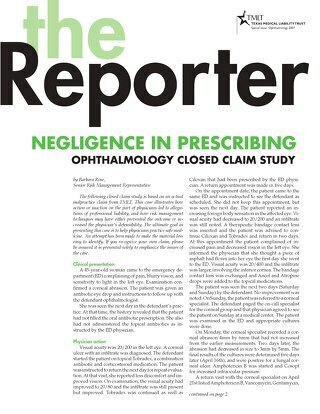 Based on the jury questions that were submitted to the judge during their deliberations, it was apparent that the jurors were having difficulty deciding the case because of the lack of documentation of the conversations between the patient and Ophthalmologist B. This case was settled during jury deliberation at trial. In this case, the lack of documentation clearly compromised the physician’s defense. Had Ophthalmologist B documented what the patient told him — that there was no pain or significant worsening of vision — his actions would have been more defensible. Documentation of telephone conversations with patients, including after-hours and weekend calls, is prudent risk management. Although this documentation can be challenging, it is in both the physician’s and the patient’s best interest to document the details of any calls. Phone call documentation should include not only what the patient reported, but the physician’s specific response or advice. Options for the documentation of after-hours or weekend calls include the use of dictation and pocket message pads; logging on to electronic medical records and entering a note; or review of answering service logs to prompt physician documentation. Practices have come up with many creative ways to facilitate documentation of calls. Some use answering service logs to allow staff to pull paper charts for physician documentation, or to enter “tasks” in the electronic medical record. Electronic tasks that include the patient name, time of call, and any other details supplied by the answering service, can then be sent to the physician for review and completion. Other practices have devoted phone lines that physicians can “speed dial” to dictate a quick note about the call received. Staff can then transcribe the note into the patient record the following day and distribute to the physician for review and sign-off. Physicians are encouraged to try different methods of documentation to determine what works best for their practices. Although never easy, documentation of after-hours calls can assist subsequent providers in providing appropriate patient care, and may also be valuable in the defense of a malpractice claim or Texas Medical Board complaint.